Have you ever noticed that everyone always seems to converge in the kitchen? You have a den, living room or family room… and yet the kitchen is where your family so often gathers, and where priceless memories are created. Having a small kitchen can cramp your style. Fortunately, there are many kitchen remodeling tricks you can use to make a small kitchen look and feel much roomier. Home designers often use mirrors to fool the eye into thinking a space is much larger than it is. Try adding a mirrored wall or backsplash to your kitchen to create an illusion of grandeur. Aside from mirrors, there are other ingenious ways to give greater depth to your space. 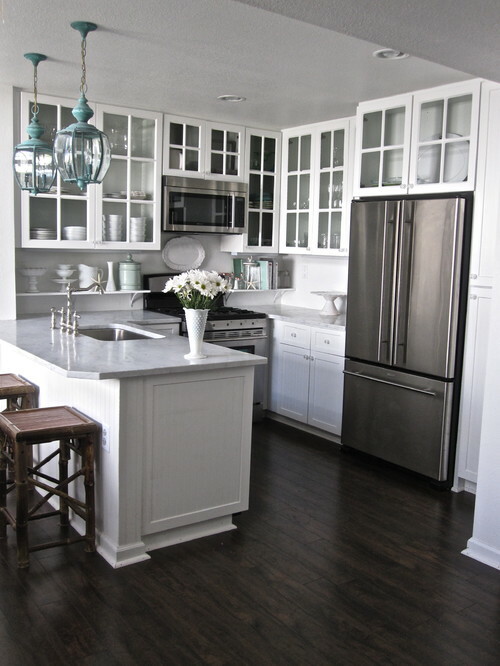 Consider replacing your solid cabinets with glass cabinets, and watch the walls recede. Fill those cabinets with color-coordinated and/or glass dishes to keep the room from looking cluttered. It is well known that high ceilings can make a room look larger. Even if you don’t have high ceilings, you can create the illusion of higher ceilings by directing the eye upwards. To do that, try adding beautiful details to the top of your walls with colorful prints, stunning moldings, or decorative serving dishes. Brightening up a kitchen can instantly make it look vaster. Try using minimal window treatments to invite natural light. 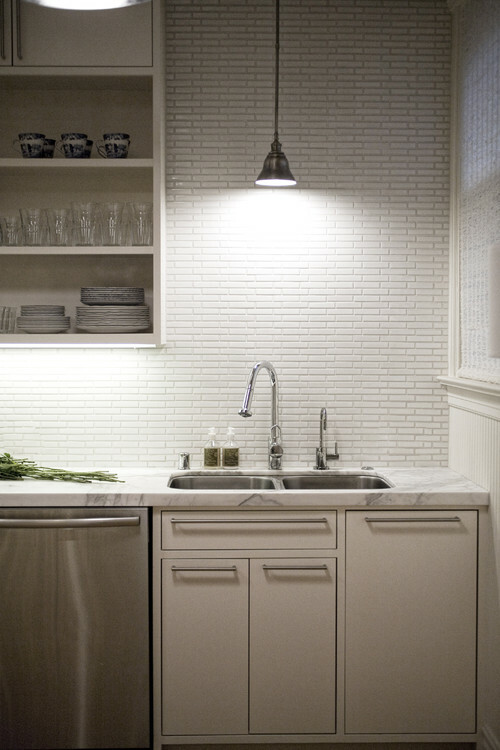 And consider pot lights & streamlined light fixtures to brighten up your kitchen without creating visual clutter. 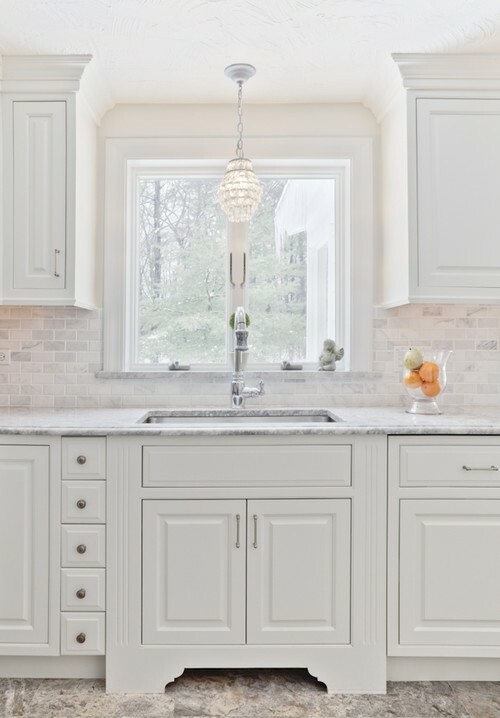 As a general principle, to create the illusion of a larger kitchen, ensure that the eye can glide smoothly over the space without stumbling, by avoiding jarring color contrasts. 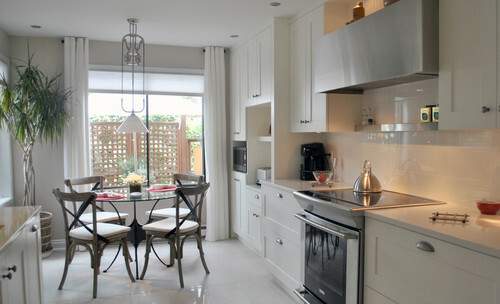 Sticking to white is an excellent way to reflect the light you have, and make a small kitchen seem vaster. Unfortunately, an all-white kitchen can also look sterile. Consider using different shades of white, and a blend of textures to warm up your decor. 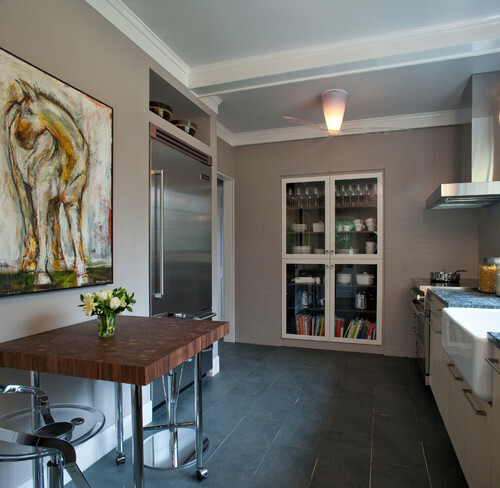 If at all possible, consider opening up a wall to an adjoining room to invite more light and make a small kitchen feel airy. 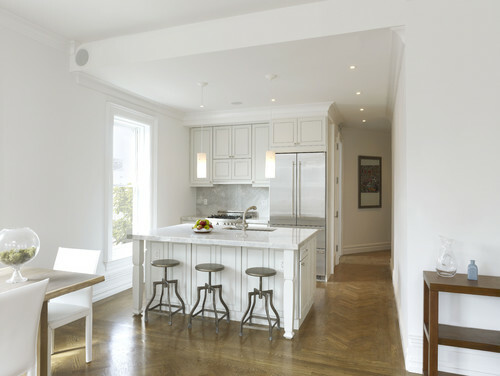 Heavy and ornate cabinetry can weigh down a small space. 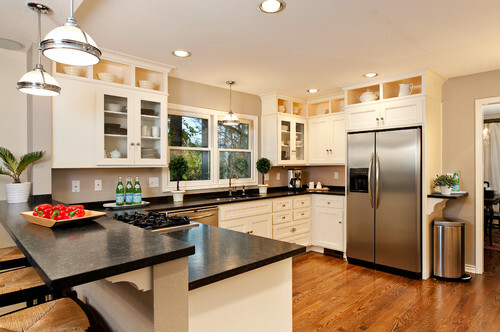 You can make your kitchen feel much roomier by using sleek cabinets with straight lines and minimal adornments. 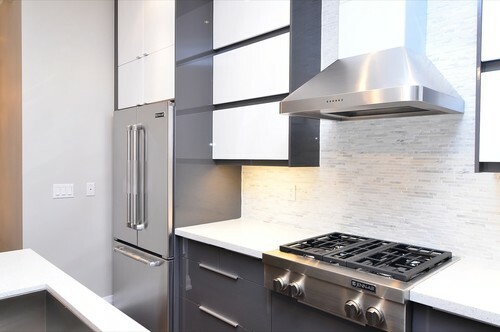 Consider stainless appliances to reflect light. Try trading in bulky tables and chairs for streamlined, lightweight furnishings with open legs that let you see through to the wall and give a larger sense of space. Fit more seating into a small corner with a built-in kitchen bench. Don’t miss the opportunity for more storage by building in drawers. You can make a small stretch of wall seem wider by covering it with an expanse of tiles. Consider small pale tiles that are wider than they are tall, to create the impression of width. 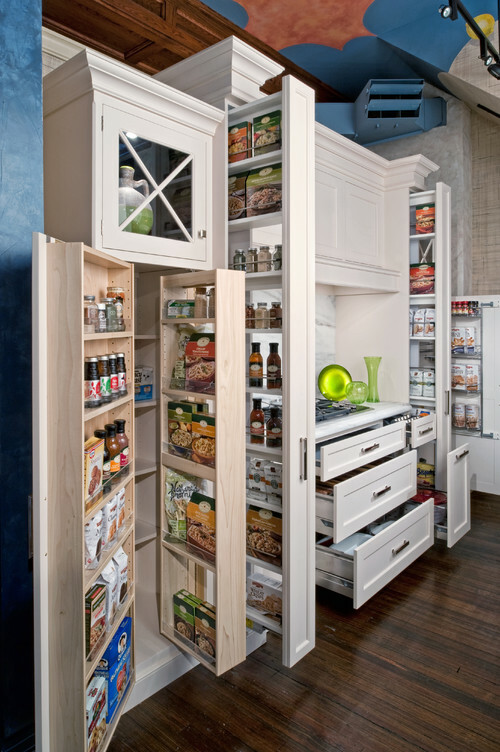 Adding storage cabinets can cut into the square footage of your small kitchen. Try building recessed shelving right into your wall to gain storage without using up valuable floor space. Cluttered surfaces can make a diminutive space look even smaller. Make the most out of your space, with efficient storage solutions that put everything at arm’s reach while keeping your countertops clear. 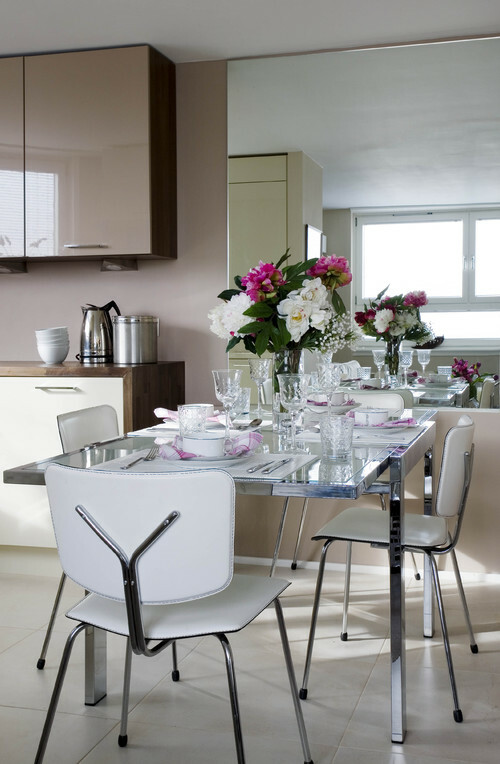 You can make your small kitchen look and feel roomier by trying some of these clever tricks. 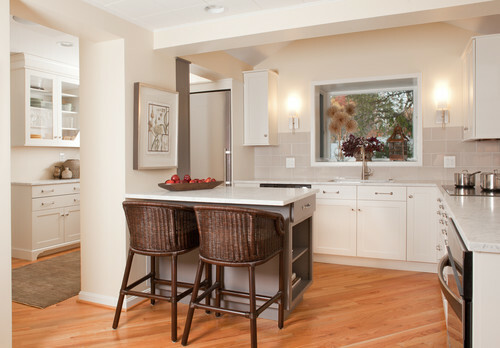 Need a little help with your Portland kitchen remodeling? Contact us today.